Enjoy the umbrellas and sunloungers for a relaxing day at the beach. After a day at the beach, enjoy amenities at Grand Bleu Sea Resort Hotel such as the free kids' club, the seasonal outdoor pool and the kids' pool. 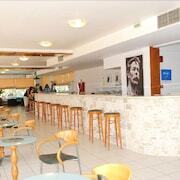 The hotel offers a restaurant, a coffee shop/café and a snack bar/deli. Guests can unwind with a drink at one of the hotel's bars, which include A beach bar, A poolside bar and A bar/lounge. A computer station is located on-site and wireless Internet access is complimentary. This beach hotel also offers outdoor tennis courts and a garden. Complimentary self-parking is available on-site. Grand Bleu Sea Resort Hotel has designated areas for smoking. 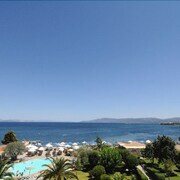 This Eretria hotel is on the beach, 1.7 mi (2.7 km) from Eretria Port, and within 16 mi (25 km) of Nautical Club of Chalkida and Fortress of Karababa. At Grand Bleu Sea Resort Hotel, hit the beach where you can enjoy kayaking, then dine on-site at On-site venue. All 175 rooms provide conveniences such as living rooms and fridges, plus complimentary wireless Internet access and TVs with digital channels. Other amenities available to guests include furnished balconies, in-room massages and hairdryers. 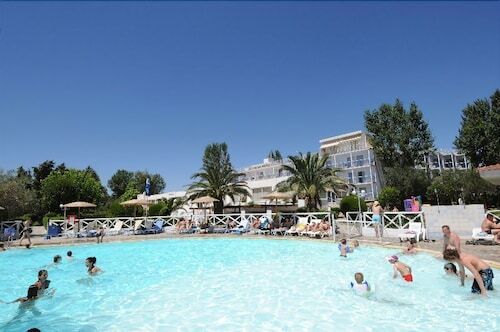 Grand Bleu Sea Resort Hotel offers 175 forms of accommodation with a safe and a hairdryer. Rooms open to furnished balconies. This accommodation offers separate living rooms. Digital televisions are provided. Bathrooms include a shower. This Eretria hotel provides complimentary wireless Internet access. On-site venue No. 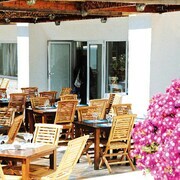 2 – This restaurant specialises in Greek cuisine and serves lunch and dinner. Open daily. A children's pool and a seasonal outdoor pool are on site. Other recreational amenities include outdoor tennis courts.